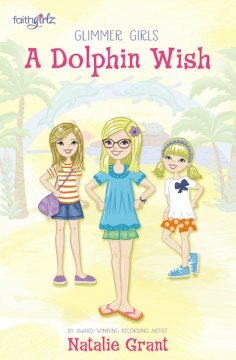 Glimmer Girls series is a new series of books for tween readers written by Natalie Grant. My 12yo read this book pretty quickly and she really enjoyed it. A Dolphin Wish happens to be the second book in the series. We did not read the first book and that did not seem to bother her at all when she read this second book in the series. I received the e-book version of this book. It was easy to download to my computer. I then emailed the file to myself and opened it in iBooks on my iPad. She was able to read the book at night before bed. It took her about 3 nights to finish reading it. It was great! There were three girls in the story their names are Mia, Maddie, and Lulu, and they were all sisters. Mia has always wanted to swim with dolphins. but at the theme park she didn't get to. I enjoyed this book because there was a big mystery that Mia wanted to solve before Maddie, her sister, because Maddie solved one in London, in the first book. The mystery all started at a theme park that they went to on a vacation where their mom had to do a concert. There were a lot of aquariums. Some of the animals were being let out of their habitats by someone, but they couldn't figure out who it was. Then they saw a boy carrying a red backpack and a key to get into a habitat. They told the workers at the info desk what they saw, and they were sent to an office to talk to Gabrielle. They found out that the boy's name was Jackson and he was a worker's son. For her prize of figuring out what the problem was she got permission to swim with the dolphins. This was a great story to teach you about God's love for you.